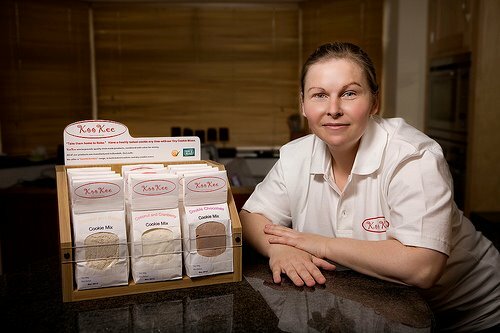 Pauline's love of baking started from a very early age and her years working within food manufacturing has given her a valuable inside knowledge of how to run a successful artisan bakery. The inspiration for KooKee came after spending saturday mornings baking cookies with her three children. She gave up work to become a carer for her eldest son, who was diagnosed with a form of Autism. Saturdays became a ritual baking day to involve all the children in a fun family task. After many weeks and lots of cookies, Pauline and her children started giving them as gifts to family and friends. Soon they started asking for some speciality orders and offering to pay. Over the next few months Pauline perfected her recipes and decided that this would be a wonderful way to care for her kids and make her hobby into a business. So in 2009 she registered KooKee and tried out her products at farmers markets and craft fairs. As interest grew Pauline contacted the Louth County Enterprise Board who helped her get ready to launch her ideas. With her family ever expanding Pauline owes much to the support of her husband and the enthusiasm of her children. Now KooKee is going from strength to strength with 11 flavours including certified gluten free, wheat free and dairy free varieties. Kookee's bake at home innovative cookie dry mix range, is easy to make, easy to bake, and with no machinery required, just some eager hands, is a great activity for kids small and big to get involved with, and get a nice quality treat from. The dry mixes can be easily adapted by the consumer so that it is suitable not only for gluten and wheat free diets, but also for vegetarians and vegans.